“I found my thrill on Blueberry Hill…” I love the colors of blueberries. Ultraviolet. I love it. Get out there and enjoy. Even my amaryllis is laughing. And I can dive right into getting started. The Bigfoot shawl for Andy’s wife that I started last Friday? Done. Just needs blocking and drying. I can’t WAIT for them to get it! Planetary excursion: the hubby and I went to Green Planet in Campbell on Saturday to check out the newest yarn store around; I wish Beth, the new owner, great good fortune, and she’s off to a wonderful start. She has big enough chairs for my sweetie to sit in comfortably–this is rare, for my 6’8″er–with WiFi, to keep the non-knitting Significant Others happy. He approved. Houston, we have a positive on that trajectory. Go to http://littledee.net/ , scroll down a bit, and see the author of my favorite comic strip and what he’s got in his hands. So tell us, Chris, is it merino? Is it superwash to survive what your characters will put it through? Vachel wings and Dee knee-highs next? When we bought our house in ’87, it had this red climbing rose that resembled the ones lining the fence at the edge of Stanford campus. I had always thought of roses as the most fragile of flowers, and yet theirs grew in the middle of a dried-out area and climbed and bloomed happily and freely. My red one, on the other hand, was in terrible shape with black spots and I didn’t expect it to last a year. Which shows you what I knew about them. It’s grown into a magnificent plant. Meantime, the Picotee has opened up, and I moved it to where I could see it better looking out my window here. Every good family photo album has to have a set of bunny ears in it. This amaryllis is coming up next. No, I’m not showing pictures of the project yet. 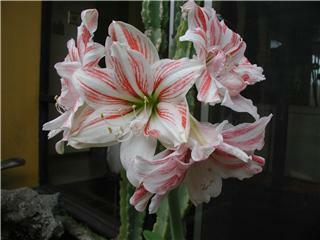 Today’s Picotee amaryllis, not quite all the way open yet, will have to stand in for it. Gotta have some surprises. (Right, and I’m as good at holding off on anticipation as a five-year-old on Christmas Eve, we’ll see how long I last.) I came down with a cold the day after I got the yarn, had to put it away for two weeks, and finally now I can safely knit it up for them. At last. I got a note from Andy a little while ago that totally made my day, telling about his having taken a walk outside of the hospital, at last, on a beautiful day, wearing his “magical scarf.” There’s nothing like a knitting recipient who loves what you (and Tina!) created to make you want to create more. I offered to knit his wife a shawl or scarf, whatever she’d like, asking for shaping and color suggestions. I wanted to get it right. I wanted them both to feel supported and thought of. The family of the patient has it, in some ways, harder than the patient. They need not to be forgotten. I was going to dye something from my stash, but when I heard back, I knew none of the base yarns I had would quite get to the colors she liked. I went to four yarn stores, searching. –there was one. One only. It leaped out at me. It screamed, I am THE shade! Right, yarn, tell me, how do you know? But I just knew. And it was so soft. So perfect. I stood there in Creative Hands in Belmont, then, flashing back to the Crohn’s of five years ago: lying on my side in a hospital bed, too weak to hold up the edge of the page I was trying to read, too far gone to register a lot of what it said anyway: every lab mouse that sneezed was written up in those pages. But my husband and I needed to understand what we were deciding on. The doctor had his (positive, it turned out) feelings on the subject, but he wanted our input before telling us his gut feeling. The side effects of the experimental med being proposed included MS and lupus. (Hah. Beatcha.) Absolutely not to be given to patients with those or any neurological diseases, since it damages nerves. It depresses the blood pressure. (Great. I’d already done 63/21 once, memorably.) And on and on. My lupus had killed off the previously-working main nerve to the right side of my heart; there, as far as anybody could guess, would go the rest. And I utterly knew in my bones that that med was the door to life for me, and not to risk it would be to die. I was so close. Whatever the outcome, let it happen, I wanted to live. I fully expected never to be able to digest food normally again and to be on TPN (tube feeding) for life, but if that’s what it was going to cost, I’d take it. I remembered my friend Neil’s dad with much gratitude, telling me that getting a pacemaker was no big deal. You just do what you’ve gotta do. I stood in that store, knowing that one does not choose something like a bone marrow transplant except under circumstances where it comes down to the simple choice: I want to live. Remembering not knowing how I was going to find the strength to take the next breath. Nor the next. And my doctor coming in just then, needing me to live, imbuing me with that strength I needed so much simply by his caring presence, in a way I cannot begin to describe. It was one of the defining moments of my life: our presence and our caring matters. It matters. And the med worked. Pass the Green and Black’s mint dark chocolate. That small frivolity became a great joy. I stood in that store, flashing back to Andy’s words: his trying not to complain, his briefly mentioning the fatigue beyond fatigue, his thanking me for recommending the book “100 days” by a doctor who had had a bone marrow transplant too, someone else out there who knew what it was like. Fatigue beyond describing to the living–Andy only barely touched on it in his note, but it was okay to tell me. I knew it well. I pictured how that exquisitely soft yarn would beckon Andy to lift his tired arm to put it up around his wife’s shoulders as he continued to heal, finding both strength and softness in her presence. I mentally apologized, and am still doing so, to every person I’ve ever knit for who didn’t and won’t also get a project made out of Jade Sapphire–but hey, please know, you’re in good company. I’ve never sprung for it for me, either. Although, you know? Truth be told–I guess I just did. I was going to blog about the silk shawl yesterday. The one I’d started Monday afternoon–I was going to finish that last purl row, do the cast off, and block it Thursday night and brag about it the next day. But I didn’t. I did take its unblocked picture Friday when I did cast off, but it stayed in the camera. Nancy sent me her amaryllis photo so I could post it, and thus, yesterday I ended up talking about her turtle instead; her turtle had always charmed me. You had to look carefully for it every time you walked into her house through the atrium, thus, every visitor was invested a little bit in its well-being. Cactuses just don’t have that same hardshelled charm; I miss it now that it’s gone. Fifteen minutes after I put its story up here, Nancy, not knowing I had, called me out of the blue and told me more about it, and that last line got added to yesterday’s post. A friend of a friend lost her friend to an untimely death, and I followed the link to go offer my condolences. Nobody should have to suffer such a great loss alone, and it doesn’t matter if she knows me or not–I knew what that kind of pain is like, and that is enough. It behooved me to speak up, however briefly. She followed the link back to my blog and was gobsmacked. She wrote to me about her friend’s having gone out of her way to rescue a turtle in the roadway. She told me she herself had seen a turtle in the roadway that morning, at a place she never would have expected, thought of her friend, and had rescued it, grateful for the chance to put it out of harm’s way. And here I was writing about Nancy’s small box turtle. She took great comfort in that. It had somehow survived, it had been taken in, and it had continued long and well loved. I imagine it was as if her friend were wrapping her arm around her shoulders going, here, read this. It’s okay. We’re all in this life thing together. Meantime, this is noise by comparison, but, here’s yesterday’s photo, short and bunchy straight off the needles, and longer and smoothed-out and blocked, above. It’s the Michelle pattern from Wrapped in Comfort, in a 7/2 kind of crunchy-feeling handpaint silk, downsized and knitted on size 7 (4.5 mm) needles. My friend Nancy was helping me out with some stuff about a month ago, and I gave her her choice of amaryllises in bud to take home. Last night, after our knitting group meeting, she gave me the bulb back and then emailed me a picture of her Dancing Queen while it had been in bloom at her house so I could put it on my blog. Cool. Thank you! I have to tell you about her turtle, since I have a thing about turtles anyway. She opened her door one day years ago to find a small box turtle on her doorstep, unable to reach the doorbell but trying to knock to come on in. Well, hello, who are you? See that area behind the amaryllis? The rock, the cactus? Her house has an enclosed atrium: you walk in the front door to a glass-covered outdoorsyish spot, complete with bubbling fountain and plants growing in the ground, a greenhouse, basically. Continue down the flagstone pathway, enter the sliding glass doors looking onto the atrium, and you’re the rest of the way inside. Somehow Nancy’s turtle had survived all that development. She and her husband took care of it for decades, and when it finally passed on, the vet had guessed its age to be 130. It had seen Mark Twain’s day. And it had beaten every odd thrown against it, and at about 100, had found the place where it was welcome and warm and comfortable and fed and had lived surprisingly long and quite happily ever after. In 1492, Columbus sailed the ocean blue, risking life, ship, reputation and crew to maybe fall off the edge of the flat world or have them all be devoured by monstrous creatures of the deep, in order to…save the world from bland and boring food. He wanted a new spice route. One man’s career choice, and it changed a few things. First things first. Ditch the suitcases in the entryway: after frantic packing after the last college final, then an hour’s drive, an hour or two at the airport, an hour’s flight, an hour to collect her bags and get home, the kid was starving. Which is why the next thing I saw was her hunched over, rear in view through the garage doorway, looking through the big freezer. Something that would cook fast, while I was offering her a banana to start off with, peeled and ready to go. “MOM!” came the spluttering, befoozled, what-on-earth tone. “Beef Samosas? Do you know what… Samosas are an Indian food, and–*beef*?” She was shaking her head from wanting to ask, and then finally did ask, “You *do* know what animal beef comes from? Right?” In SAMOSAS. Totally nonpsychodegradeable. Well, hey, they have a nice spiciness to them. Welcome home to Californian multiculturalism, kiddo. Oven at 375. Two weeks now–I ought to have finished shaking this cold off by now. I’m almost there. I have someone I promised a shawl to, but with a compromised immune system in their family, I don’t dare touch their yarn nor breathe on it till I’m totally over any germ. Which gives me an impromptu deadline: finish this one before I get better, because as soon as I am, I’m ditching this and diving into theirs. Someone on Ravelry gave me a heads-up yesterday that Knitpicks had started a knitalong using my “Wrapped in Comfort” book. Cool! I joined it (how could I not!) and mentioned that I’d started this Michelle shawl on Sunday. Oops. Wait. No, I’d started it Monday. But I can’t edit on someone else’s blog. Here, see, if you stretch it out to get an approximation of its future blocked self, I had knitted 14″ worth by Tuesday night–time’s a-wastin’. This is 7/2 spun silk, handdyed, from Village Spinning and Weaving in Solvang, CA, bought at Stitches West from some of the nicest people you could hope to meet. Maybe one more day of this cold? I’ll finish this and get it out of the way in time. Hey, I’m as much a procrastinator as anybody–I’ll make my deadlines where I can find them. Back to work. Richard and his dad each had a bum tooth that had gone through a number of gold fillings, and his dad had collected the gold each time they’d been replaced. Dad Hyde had wanted to try playing with them for some time, and this was his chance. Their dentist went in on the project with him: they got our ring sizes, got some casts, melted those down–it was 20k, quite soft (22K? )–and created wedding bands for us that were plain and simple and like nobody else’s anywhere as far as we knew. It was quirky, it was creative, it was frugal, and I found it totally charming, other than that it felt like cheating that I wasn’t really giving him a ring from me so much as permission to wear that one. So, with that mindset in the background of Richard feeling like gold was still somehow stratospherically expensive, when I found out that Addi was selling gold-plated knitting needles (which have since been discontinued), I plotted with my daughter, who’d been wondering what to give me for Christmas. They actually cost less than my beloved and now-also-discontinued Holz and Steins, and I could just picture knitting in waiting rooms and the like with them: talk about a way to open up a conversation with one’s knitting! Good as gold! Not to mention. I opened that present on the day, trying to play innocent and not grin too hard at my frugal husband’s expense. He totally fell for it. GOLD knitting needles! He was trying to bite his tongue, and totally failing at it. Isn’t that taking this knitting habit of yours a bit too–I mean, how could–Michelle…! If only I had a video of his face just then to show the future grandkids. It was so priceless. I spent 24 hours, after he came home from the grocery store with those, trying to figure out how on earth I was going to sweet-talk him out of the house at the very time he would be expecting to be cooking up his filet mignons in celebration. She guffawed loudly and waved us away while Richard grinned. Good old Jo. There was a look of utter confusion on his face (and he got off the phone)–I’d already given him his birthday presents. But the tone of my voice conveyed the right amount of Do Not Argue. Come where? Kitchen? Huh? There was only one problem while all this was going on–I’d been told through the grapevine when to show, the time had been changed, and the grapevine had shrivelled before the harvest rather than gotten back to me. Oops. Which is why we pulled into the (right) cul-de-sac and nobody answered the door, and just after we got back in the car with me having to explain, the first would-be-surpriser showed up. We gave the guy this huge sheepish oh-well grin, waving, and pulled away, all of us laughing. Richard, who can hear on the cell phone whereas I most often can’t, called the host just to make sure we did have the right host and that that too hadn’t been changed. We did; come back in a half hour. Silly people. About ten minutes later they called again, saying, come now, and so we did. And I think that way was maybe the best of all. Because now he gets to laugh and tease about it for the next 50 years. And dinner was far better than anything we could have conjured up alone, both in food and friends. Happy birthday, sweetie. And Nina and Johnna and everybody who came–you guys totally rock. Thank you. He had never owned a sweater long enough in the arms to be able to fold the cuffs back, and that sounded to him like the most exotic luxury. Which was a little funny to his wife, whose arms are short for her size, who would like not to ever have to fold hers back again. I was newly back at this knitting thing after a half dozen years’ break or so, and I wanted to knit him an aran–one that fit. I spent a lot of time going to various yarn stores (internet? What’s an internet? He used Darpa net, but the Dept of Defense didn’t stock knitting patterns) looking for anything big enough, and finally decided the only way to do it was just hash it out as I went along. I did find a pattern and follow the stitch counts for guidance, just, I used a heavier wool and substituted my own stitch patterns and…oh goodness, I didn’t know a thing about needing to swatch each stitch to get the gauge right. Eyeballing wasn’t good enough. Which means I ripped out the first eight inches three times before I got it right. But I got it right. It took six months, altogether, to knit. It was supposed to be for Christmas. Then his birthday. He got it for Father’s Day, and there’s a picture somewhere of it in glorious motion as he pulled it out of the wrapping paper, lifting it up high in glee with the very biggest grin on his face. And look–the cuffs folded back just so. It fit perfectly! Success! Surprised? Honey, I saw you sneaking those needles away when I came home from work. Eighty-six inch wingspan on that baby. Four and a half pounds of wool. He teases me, eighteen years later, that he’s only allowed to wear it by permission and where there isn’t going to be any food (but ain’t that the truth.) This picture was snapped fast as it collapsed downward on the chair. Happy birthday, honey. Half a century. Maybe I’ll knit you another in your second half century, a little lighter weight (but that is SO not a promise). Dude–you sure you don’t want a shawl? Where’s a flowery phrase when you need one. If I knew the chemistry of the various possible mordants and their effects, I might well have been able to alter how the color came out.Â Still.Â I like what I got.Â Eight hundred seventy-five yards of April-blooming amaryllis-colored alpaca/silk.Â One of a kind. I was clipping off the spent amaryllis flowers to try to get a good photo of the ones on the stalk still going, and, as I often do, got red dripping onto my hands. Staining my hands. It took some scrubbing to wash it off. Them’s protein fibers there, hon. Okay, I know you’re supposed to have so many pounds of natural dyestuffs per pound of fiber, but this is what I’ve got and I’m curious to see. “If this is a yarn date, I get to have radio dates.” Okay, I’ve gone to a few of his ham radio meetings already, and I threatened to (again) bring my knitting to those if he said that. We called it a truce, and pulled up to the store. I snuck in on tiptoes (while various friends waved silently hi) and whispered to Nathania, “I have a yarn emergency!” Okay, me whispering is a bit funny, because I can whisper but I can’t hear whispering back and I can only guess how I sound because I just plain am totally deaf to it. But I didn’t used to be, so I think I can guess reasonably okay. She was patient with me. They all were. I didn’t need words in answer anyway, just a nod that yes, it was okay to buy yarn on movie night. She laughed. Bottom cubby at the end, I knew, I went right to it. I knew how much yardage I wanted, I knew what I wanted to make, and I knew I could never make it with anything thicker than laceweight–there just weren’t enough blossoms, and I sure as heck wasn’t going to break off any still in full splendor. Not that I didn’t think about it. The Lady Jane looked right back at me and declared frantically, You don’t wear orange and you know it! …Okay, you’re fine. “Oh, but in a handpaint they can. But if I do that, people will think the blotches are from the amaryllis. But if I don’t–will more of the dye take up if I put it in dry? But whatever hits the water first will soak up most of it, thus the blotches.” He put up with my working it out out loud. I decided I was going to have to wash the hank first anyway, just to make sure there was no leftover mill oil that might keep the dye off. So that means it would be wet and would take up color evenly. Fine. We got home, and I fished all the flower parts out of the now-cool water and turned the heat back on under it. I put the Fino in and the yarn kind of put its hand on its hip and went oh, yeah? So what? Oh. Right. I fished it back out with my dye spoon, glugged some vinegar in while holding it aloft, swished it around a good one with my free hand tipping the pot back and forth, and put the hank back in. Alright! That’s more like it! It is bubbling away, and so am I. I’m having way too much fun. That was good, can I have thirds? Shawl notes first: Wanda’s Flowers pattern from “Wrapped in Comfort,” Lisa Souza’s handdyed Petal yarn, 50/50 silk/merino and very soft, started Sunday and I finished the last four rows Thursday. I went down one needle size from the book, using a 5.5 mm (American 9). This pattern is not as wide around as a lot of my shawls, and at only 279 stitches across the body, it works up fast. (Don’t let your gauge stray too tight, though.) Shawl pin is handblown glass by Sheila and Michael Ernst in a flower design, one of their smaller and simpler pins. I had enough yarn left over from the one skein that I used that I could have done half a repeat more, one more flower’s worth going downwards. Now. The rest of this post is in response to a query about my photographs. All I ever needed to know about photography, I learned in third grade. My daughter’s third grade teacher way back when, actually, who casually mentioned to me one day, glancing at an art project of my child’s, that oh yes, she had taught the kids that pictures are most interesting if you can divide them up into threes. The eye likes odd numbers of things, not even: she demonstrated. A tree, standing alone. Perfectly centered square in the middle? Boring. But put that main feature so that it’s taking up roughly 1/3 of the space, or 2/3, especially if it’s somehow on the diagonal relative to the frame, to somehow give it motion: interesting. Thirds up and down, thirds side to side, either, or, better yet, both. If you can’t do that, make it at least off-center. When I thought about it later, I realized I’d instinctively gone by that basic idea for a long time, but nobody had ever put it into so many words for me. I’m sure my little sister learned all about that in her art lessons growing up, but somehow my piano teacher never said boo about it. Wait–come again, maybe in effect she did: all those piano pieces with codas to go back and play the beginning part again at the end? Thirds. Alright, class, homework is to go shoot your best flower picture. Okay–there’s the bell. Class dismissed! And Canada, we are NOT having a snow day tomorrow. Last night, just before Sean posted his Change of Shift edition–you have to love how his Coliseum picture looks like the open mouth of a roaring lion, including the teeth! Hey lion, you’ve got a few cavities there–I found myself suddenly grabbing that amaryllis pot and plunking it in front of the azaleas, hoping there was still enough daylight left for some good shots. There was. That post came tumbling out of its own volition. And I wondered afterwards who it was really for. I referenced my nephews because they’re family and they’re the identical twins nearest and dearest to me. But I kept thinking, the timing of that sudden impulse. Curious. There would be people in the medical profession who might happen to see it if they read more than just the post Sean linked to–ya gotta love Amy’s story–and I wondered if Anne’s teasing her boys or especially the amaryllis analogy might be used to help some other twins out there whom I know nothing about. I quite hope so. As for the how many of those things do you have question, that got me to go count their pots. (No, I don’t plant them in the ground outside: if they freeze, they die, and the rampant non-native snails in California adore them, I’ve learned.) Now, I’ve got some flowering right now because I’ve gradually staggered the timing of bringing them out of their annual dormancy period, trying to stretch out the blooming time well past December. Note that the stalk on this one is very short: that’s because the bulb was kept dry so long that it needed that extra energy to stay alive–but I’m getting my favorite flowers in April for it. Next year it will be toweringly tall the way it was meant to be and will have made the full transition from the Southern Hemisphere to the Northern. I always tell my family that an amaryllis bulb or two is all I want for my birthday. Though I give quite a few away–nowhere as generously, truth be told, as I do my knitting–I do get many of the ones I keep to bloom from year to year. (Hint: start with the bigger bulbs, not the tiny drugstore cheap ones.) The current count: a nice even 50.Â My age plus one.